Whether you’re a coffee aficionado or you see coffee as a necessity to get you up in the morning, the quality of the coffee does of course, make all the difference. And if you think home brews just don’t taste the same as your daily coffee shop run, then you can think again. We’re bringing to you a list of some of the best coffee beans so you can grind your own and achieve barista quality in the comfort of your own home. Other than your personal taste, the main thing to consider when choosing the right coffee beans for you is your brewing method. Typically French pressed coffee usually tastes best with light roasts such as the Whittard Blue Mountain Coffee in our top spot. Filter coffee machines work well with a medium roast, and espresso and drip machines can create delicious tasting coffee with any type of roast or a blended roast. Check out our round up below to find your perfect blend. If you’re not a fan of bitter coffee, then you may find that the smooth light roast of Whittard’s Blue Mountain coffee is just right for you. Those who have tried this blend found it to make a full-bodied but mild coffee both hot and cold. 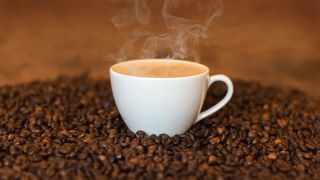 So if you don’t have one particular type of brew, then this is a versatile coffee bean that you can expect barista-style quality from in every cup. Okay, we’re kidding, it’s not actually a death wish; it’s a strong and powerful blend but not too overbearing. It’s rated highly among coffee lovers not only for its beautiful smell and rich taste, but for its well-designed and humorous packaging. If you’re an espresso drinker, you may find this slightly too rich for you, but add a dollop of frothy milk and you can expect something very smooth and palatable, despite the high caffeine content. This is a Fairtrade blend which might appeal to those who have a little bit of a sweet tooth. The coffee bean Yirgacheffe is a mocha coffee bean, so you can expect to taste light floral and berry notes with a chocolatey body that gives this bean something unique. To make the most of the flavours, a French press is recommended, as you may not be able to fully experience what this bean has to offer in a filter or espresso coffee. From the island of Sulawesi, this Jamaican coffee bean offers something a little different to the variety of flavours you might be used to. This bean is made entirely from peaberries which is said to make the coffee quite creamy with a very obvious fruity taste. It is recommended for brewing with a filter or drip machine for best results. You can expect a fresh and somewhat fruity taste from this Three Sisters coffee that is bound to wake you up in the mornings. Recommended for brew via French press, drip machine or pour over methods, this versatile coffee can be used for all types of beverage both hot and cold depending on its grind. Coffee aficionados may pooh-pooh Lavazza as a brand, but in actual fact it’s difficult to argue that this Italian blend doesn’t taste good. Its slightly sweet, medium roast is good for anyone who has just started exploring the world of coffee as it’s not too bitter, and those who’ve tried it find it’s great to use for any type of coffee from espressos to lattes and cappuccinos. Coffee lovers looking to try something a little different might like the full-bodied texture of this dark roast. Containing 100% Arabica beans, you can expect notes of caramel and chocolate that would be palatable in a milk coffee such as a cappuccino or latte. These beans can also be ground to your desired coarseness for brewing in a cafetiere, filter machine or espresso machine.